My kids get so excited when I serve them foods cut into different shapes. 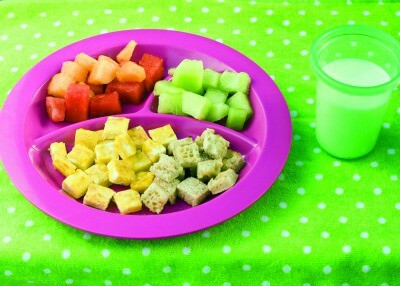 FUNBITES™ takes this idea to new levels with a set of two products that cuts children’s food into fun-shaped bites. FUNBITES™ presents the Cube It! and Luv It! sets which instantly transforms ordinary sandwiches, pancakes, fruit and more into cubes and even a giant heart created from 10 geometric shapes. I really like these products because it is very easy to use and it is designed so that my hands never even have to touch the food. The cutters have curved blades that slice the food quickly into the smaller bite shapes that my kids absolutely love! Whenever I serve my kids a grilled cheese sandwich using the FUNBITES™ cutters, I am always greeted with applause and then an empty plate is returned minutes later with a big smile on their faces. As a mom, I am always concerned about the products that I use to make my children’s food so I was pleased that FUNBITES™ Cube It! and Luv It! is BPA free. It is also dishwasher safe so clean up is a breeze too making it perfect even on busy days. If you are looking for a fun, creative way to jazz up your children’s food and maybe even get them to try things they wouldn’t normally want to eat then I highly recommend FUNBITES™. These are durable and very affordably priced because you can buy two for only $19.99 ($12.99 each) and it would make a great stocking stuffer idea for the holidays! You are invited to visit the FUNBITES™ website to purchase Cube It! and Luv It! One lucky reader will receive a set of FUNBITES™-Cube It! and Luv It! I liked the Luv it. It can be used on pancakes. I like that it can be used on everything from lunch meat and cheese to hamburgers, pancakes and fish. I definitely like that the pieces are small because I always worry about that! I have a 3 year-old and a 1 year-old. I swear I spend more time cutting up food than I do cooking it! This can same me a lot of time! I like that there are heart shapes and that this can be used on all sorts of food! I love that it can be used on pancakes! WHAT! I like the Cube It Fun Bites! Tofu, pancakes, sandwiches, cheese, brownies… endless possibilities! These would be fun to make the food at work more fun. I learned that she has a picky child just like ours. Hopefully this would also encourage ours to eat. I really like how you can use this on so many different types of foods. Its hard to try that with just a sandwich cutter. I love that it cuts lots of little bites all at once! 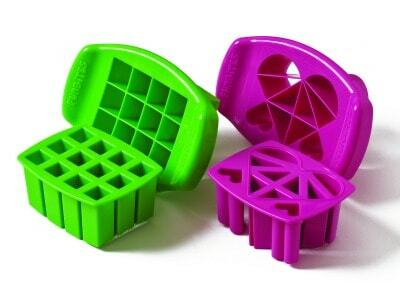 I learned that you can use this on on sorts of fruit like watermelon – my kids would love this! I’d love to use these for sandwiches and parties! Finger-food made easy! I learned that it’s made in the US-THAT makes me want to try it, aside from the coolness of it! Holy cow! You can use this thing on burgers…amazing. I like that it is easy to cut with it. I like that the products appear to fit a slice of bread perfectly so that the edges aren’t wasted. It is also very nice that they are dishwasher safe. I imagine it would be a pain cleaning PB&J if they weren’t. love that it made in the usa. I love the different shapes and that they can be used for pancakes. I like that it can cut so many foods!! I learned that the curved blades make cutting easy – just push down, rock back and forth. It can be used on pancakes. I like the it helps kids try new foods. I love that it’s made in the US. I like how easy it is to use, just 3 easy steps. I learned that this is a fun way to put a cool twist on alot of the foods I use daily, even something as simple as peanut butter sandwiches! This is great! Its an answer for keeping youe kids interested in eating.